Puerto Santiago is the central holiday resort of three separate ones, Los Gigantes, Playa Arena and Puerto Santiago, which have spread and essentially merged into each other on Tenerife's west coast, forming the area's largest tourist hub, collectively known as Los Gigantes. The resort of Puerto Santiago was once a small fishing village, but is now a popular holiday destination garnering rave reviews from most tourists and visitors. Puerto Santiago boasts a small but decent selection of bars, restaurants, shops and activities to suit the tourist palette. Puerto Santiago has managed to retain some of its traditional charm and offers visitors the chance to relax and enjoy a seaside break with local Spanish flavour; although some visitors might take a while to get accustomed to the black sand beach. The resort is peaceful and well-suited to relaxed beach holidays in beautiful surroundings. Puerto Santiago doesn't have much to offer the young party crowd, but it is only a short drive to more energetic resorts, like Playa de las Americas. There is no shopping district in Puerto Santiago, but there is an assortment of shops that cater for tourists. Shopping on the island of Tenerife is tax-free, so it is possible to find good deals on cigarettes, perfume, alcohol, electronics, and other goods. 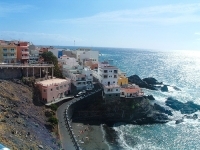 Although Puerto Santiago is not a shopping hub, there is a larger variety of shops in neighbouring resorts like Los Gigantes. A unique souvenir from Tenerife is the locally-produced sweet rum called Ron Miel. There is the usual assortment of international restaurants in Puerto Santiago, but the local Canarian eateries and tapas bars are the best. Try some of the delicious traditional dishes, such as roast chicken in banana cream or 'wrinkly potatoes' in the local mojo picón sauce. One of the most popular restaurants in Puerto Santiago is Pancho, while TJ's Entertainment Bar serves pub food like sandwiches and pies and is also well-loved. Most of the entertainment in Puerto Santiago is provided by the hotels. The nightlife is fairly laid back and many bars close at midnight. After dark entertainment usually consists of relaxed drinks and drawn-out meals. However, those wanting to dance the night away can make the short trip to one of the other nearby resorts, like Playa de las Americas, which offer more of a party scene. The proximity of Puerto Santiago to such nightlife hubs allows visitors the best of both worlds: the peaceful, quiet resort atmosphere, and the fun Tenerife nightlife. Puerto Santiago's black sand beach is European Blue Flag accredited. There are also boat trips, walks, visits to neighbouring Playa la Arena and Los Gigantes, day trips to nearby towns and points of interest, and much more to be enjoyed. Many hotels also offer their own entertainment programmes. For those visiting in July, the annual fiesta and fireworks display in honour of Our Lady Carmen is not to be missed. The main activity is sun tanning on the gorgeous beaches, but the restless will find plenty of other activities and diversions. The ocean currents around Tenerife can be very strong and swimmers should be cautious and pay attention to warnings from lifeguards.